Mini Make Monday blog feature! 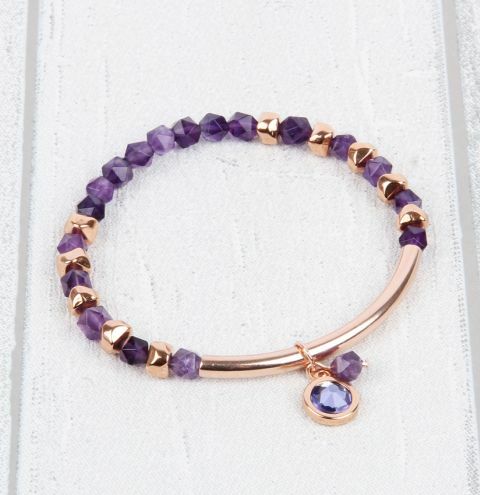 Make the perfect Christmas present with NEW faceted amethyst beads and a touch of Swarovski sparkle! Read the blog post HERE. Cut a 50cm length of elastic and thread on your curved tube so that it sits in the middle. On one side, string 1 amethyst bead then 1 rose gold nugget bead and repeat this four more times. String on four more amethyst bead and then repeat the bead pattern for the opposite side. Check the length of your bracelet and remove a couple of amethyst beads if necessary. Tie the ends of the elastic in a double knot and snip away the elastic ends. For extra security, you can add a drop of Fevi Kwik glue or nail varnish to secure the knot. Thread an amethyst bead onto a headpin, trim and loop the top. Close the loop onto the charm setting. Open a jumpring and put it through the loop of the headpin. Close the jumpring onto the tube bead of the bracelet and glue the Swarovski crystal into the charm setting.